Funny videos. These are funny videos from 1 to 5. Funny videos, each of them being funny video of the day. The list is ordered in a way so you can see newest videos first. So, if you don't like jokes, skip jokes and view videos only. 12 years old till wedding day - Photo Every Day - You are married - game is over! - link to page video is posted initially. PEOPLE ARE AWESOME 2017 | BEST OF THE MONTH (MAY) - Best videos of the month compilation featuring parkour, martial arts, gymnastics, slacklining, basketball trick shots, street luge and trampoline tricks. - link to page video is posted initially. Travel and Exchange Items (with People You Meet) - 80 days on trip exchanging items with random people on the way	- link to page video is posted initially. 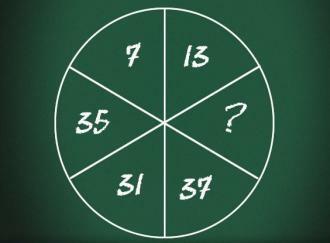 Find the logic behind the numbers and then find the missing number.